Estate Jewelry Specialists Valuation services for attorneys & executors. These days, it’s not all about the engagement ring. 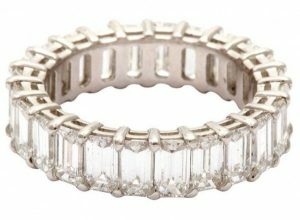 More and more couples are spending much more time picking out a stackable-style wedding band set, and according to Glamour, this trend is here to stay. Glamour says that lots of women now prefer to wear their wedding bands without their engagement ring, saving the engagement ring as a statement piece that can be worn on the right hand or on the left on special occasions. And, rather than have a plain band signify to the world that you’re married, the new trend is to show off your unique couple style with stackable sets of lots of different kinds of rings. You can stack many different kinds of rings, including those of different widths and even different metals. Per Gurary, a jewelry designer who helped Kate Bosworth design her unique stackable wedding bands, told US Weekly that mixing and matching different stackable rings on top of, below, or instead of the engagement ring has become popular among modern day celebrity brides, as well. The best part about this new trend is the range of possibilities when it comes to deciding what the wedding bands can mean to a couple. For example, a couple can select rings that reflect each of their own passions and interests individually –one ring representing the bride, a second to represent the groom, and a third that symbolizes their combined life as they join into marriage together. At Frank Pollak & Sons, no matter what you’re looking for, our diverse selection of vintage jewelry and modern aesthetics offers our customers a full range of options to choose from for their weddings or engagements. We even offer custom designs, too, so whether you’re looking for a stacked design or something completely new and unique, you can find it with us. Don’t forget: Valentine’s Day is coming up soon, one of the most popular days of the year to pop the question, and you’ll need a ring to do it properly. Shop our selection online now or call us at 800-342-3878 to learn more or to discuss custom or unique needs.